Ambassador Adalnio Senna Ganem, a career diplomat, assumed his position as Consul General of Brazil in Miami on Sept. 9, 2016. At age 9, while living in Lençóis, a small town in Eastern Brazil, he announced that he would be a diplomat in order to fulfill his dreams of traveling the world. At 17 years old, he moved away from home and to the cosmopolitan city of Rio de Janeiro, and his journey began. Prior to making himself comfortable in Miami, Mr. Ganem served as Brazilian ambassador to Panama after representing Brazil in locations like New York, Paris, Lima and São Paulo. Though he’s a resident of Miami for the foreseeable future, he was once a passing diplomat, working from here to establish a Consulate General in Georgia. He was responsible for opening the Consulate General of Brazil in Atlanta, which he headed from 2008 to 2012. The Miami he came back to six months ago is vastly different than the one he encountered during his stint here 10 years ago, Mr. Ganem said. He found that the Miami he returned to had evolved into a metropolis. While serving in Miami, he said, he intends to focus on consular issues and trade promotion, community, education and culture. Since arriving, he said, he’s met with hundreds of individuals and groups representing all facets of the community – from chambers of commerce, like the Brazil Florida Chamber of Commerce, to education representatives. On any given day, he may meet with two or three new members of the community. He moved to Miami to find a well-structured consulate operating as well as some that have much more staff. 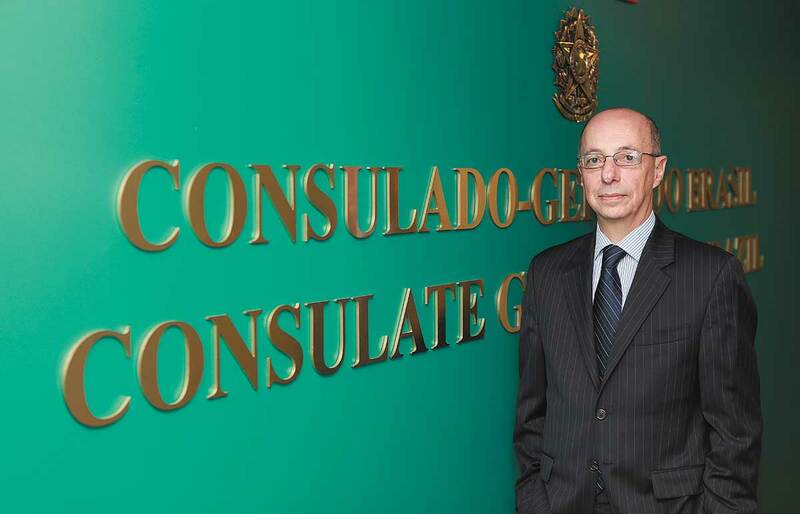 Compared to Brazil’s largest consulate abroad, in New York, the Miami Consulate operates just as well with much less staff, though they’re working to expand, Mr. Ganem said. Mr. Ganem hopes to raise the awareness of the importance of the partnership between Miami and Brazil. Though the consulate first and foremost provides consular services to Brazilians, it’s also striving to update the perceptions that Floridians, Americans and foreign US residents have about Brazil. Several events are planned in order to do just that. The consulate has helped organize a massive gathering of influential people in August in São Paulo at one of Brazil’s largest universities. Floridian political authorities and Miami educational leaders, like Florida International President Mark Rosenberg and Miami Dade College President Eduardo Padrón, are to be in attendance, just to name a few. The gathering will be hosted in partnership with the Federation of Industries of the State of São Paulo, representing 133 trade unions and approximately 150,000 companies of all sizes and of all industries. In addition, the consulate is planning to make September the month of celebrating Brazil’s presence in Florida. The whole month will be spent spreading the word about Brazil’s culture, tourism, business and even the official language, Portuguese. Brazil’s presence in Miami is already very influential, Mr. Ganem said. The community includes roughly 300,000 Brazilians from all walks of life – from artists to entrepreneurs to financial consultants. Furthermore, Brazil is Florida’s No. 1 trade partner, and an astounding roughly 2 million Brazilians visit Florida every year. They also were responsible for roughly $2 billion worth of property sales in Florida in 2015. Ultimately, Mr. Ganem’s main goal is to raise the general population’s awareness of Brazil’s presence here. One of his other goals, he said, is to better integrate the community. Too often, community leaders and institutions do their work in isolation and fail to integrate with one another. Mr. Ganem thinks that if he’s able to get them to work together, they will be able to achieve much more than they already do. Brazilians see South Florida as a welcoming place that’s open to outsiders with an already established mix of cultures from around the world, he said. Mr. Ganem himself believes it to be one of the most open states in the US, speaking from experience as he’s visited almost every state in the nation. Brazilians intend to take advantage of the emerging technology and aerospace ecosystem in Florida, he said, with São Paulo-based aerospace conglomerate Embraer, one of the largest aircraft manufacturers in the world, already operating four plants here. The biggest challenge that Mr. Ganem sees about Americans’ views of Brazil is regarding the misconception that Brazil is not diversified across sectors. In fact, he said, Brazil is very diversified and full of possibilities. Too often, however, outsiders seem to focus on the challenges of having a presence there. Mr. Ganem is the first to admit that infrastructure problems and bureaucratic hurdles do exist, but if people can look past that and see the opportunities and adapt, Brazil is full of potential. It’s the largest country in Latin America, Mr. Ganem said, responsible for almost 50% of the GDP of Latin America. Mr. Ganem recommends working with a Brazilian lawyer well-versed in the field of foreign investment in order to properly manage the hurdles. For all its challenges, Brazil is still one of the biggest beneficiaries of foreign direct investments in the world. Last year, Mr. Ganem said, Brazil received $75 billion in foreign investments, one of the largest foreign investment totals among emerging nations. Mr. Ganem is married and a father of three daughters. His wife, now a master Pilates teacher, was formerly a representative for Brazil in the United Nations Industrial Development Organization, which seeks to promote international industrial development. When he’s not promoting Brazil, Mr. Ganem can be found enjoying one of his diversified hobbies or interests. He’ll enjoy a sports game, watching an opera, or catching a pop concert just the same. Miami Today reporter Camila Cepero interviewed Mr. Ganem in his office at the Consulate General of Brazil’s Coral Gables building.